Listening to the Tibetan Singing Bowls transports Ed Susralski to a peaceful place, far from the terminal cancer that might otherwise cloud his thoughts. 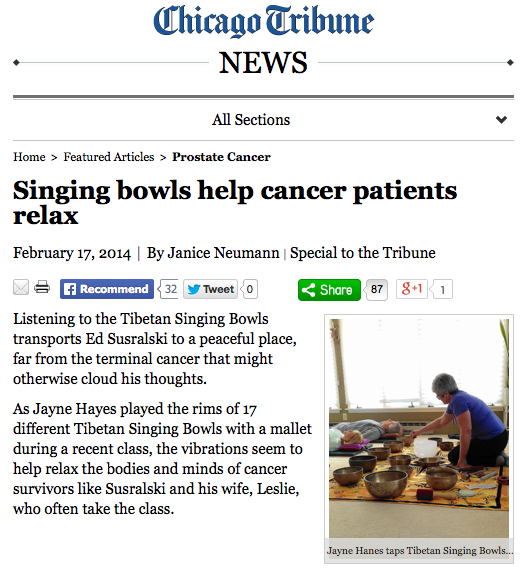 As Jayne Hayes played the rims of 17 different Tibetan Singing Bowls with a mallet during a recent class, the vibrations seem to help relax the bodies and minds of cancer survivors like Susralski and his wife, Leslie, who often take the class. 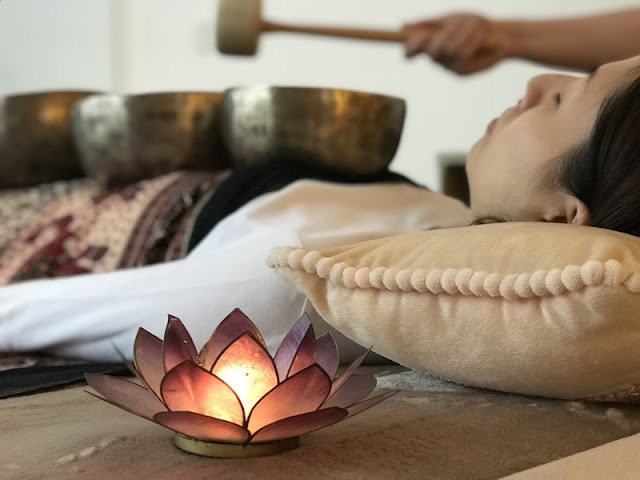 That's the purpose of the "South Bath," according to Hayes, who is a Reiki (Japanese stress reduction technique) master and practitioner and leads the singing bowl class monthly at the Cancer Support Center in Mokena. "I believe the bowls help people with pain because as the harmonic vibrations calm down the nervous system, it sends messages that also interrupt the body's pain reflex," said Hayes. Studies have shown the sounds of the bowls produce harmony and a place for healing to occur in cells, she added. Joint pain, a side effect of chemotherapy, has been reduced or eliminated for a few days, Hayes said participants tell her. 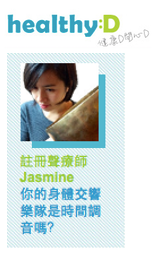 Others have felt increased energy, peacefulness and even serenity after the class, she said. Ed Susralski said he decided early on that he wouldn't let cancer control his life. So he sought out alternative healing to help him relax. "If you just sit around and dwell on these things, it will eat you alive," said Susralski, who lives in Orland Park with his wife. "I just enjoy it so much that I can go and do this and feel these things I've never felt before. It's just awesome." For relaxation at home, the Susralskis often sit in their sun room holding hands as they listen to mind-body meditation CDs. "Our deal is we go to the mountains in our mind," said Susralski, who had prostate cancer, which metastasized to his bones. After Joyce Bakotic's husband died of lung cancer in November 2013, she was overwhelmed by grief. So she tried the singing bowl class and found it helped her deal with the loss. "It helped me to relax and let go of some of the stuff I couldn't let go of," said Bakotic, who lives in Orland Park. "It just gives you an all-over sense of wellness and that I was okay. "I felt very strong when I got up this morning," said Bakotic, after the recent class. Dr. Nadine Kelly, a yoga instructor and retired pathologist, said she tried the class just to pamper herself. She felt calmer and more focused afterwards. "She (Hayes) actually placed a bowl on my abdomen and one on my chest and in so doing, that sensation of being weighted down really helped me feel more grounded, secure, safe and comfortable," said Kelly, who lives in Flossmoor . "She then rang them and so I could feel the vibrations of the sounds moving through my body…it felt cleansing, healing." The Cancer Support Center offers a variety of healing classes, including gentle yoga, meditation, a knit and crochet group for survivors, journaling and art classes. "A lot of studies show one might not be able to speak about what's going on in life, but the mindfulness of just creating a piece of art really does help relax a person," said Allison Smith, communications and marketing coordinator for the Cancer Support Center.